SD1105 NaI(Tl) detector is a high efficiency scintillation detector consisting of a NaI(Tl) crystal in an Aluminum housing, a photomultiplier tube, an internal magnetic/light shield, a high-voltage power supply(HVPS), a voltage divider and preamplifier circuit board, it can directly output the negative pulse signal. SD1105 NaI(Tl) detectors have a proven record of long term reliability and stability. Typical energy resolutions are ≤8%fwhm at 662keV. 1) Each detector is thoroughly tested before shipping and comes with a 12 months guarantee, we are responsible for the repair, replacement within the warranty period, and provide technical support. Please don’t disassemble the detector by yourself, in case of any questions please contact us. 2) The packaged product allows to transport by cars, trains, airplanes, ships and other transportation vehicles, transportation should prevent severe shock, severe vibration, rain and so on. 3) Scintillation detector should be stored in a cool, dry environment. 4) Please pay attention to the input voltage value and polarity, improper input voltage will lead to the detector does not work and even damage. 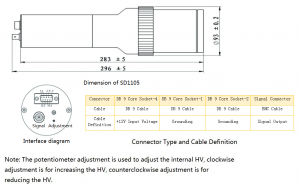 5) The cable should be correctly connected to the connector, incorrect connection may lead to detector damage. 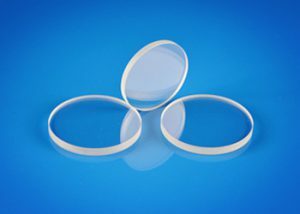 Hangzhou Shalom EO offers a wide range of Laser Windows suited for many laser transmission or laser safety needs. Laser Line Windows provide exceptional transmission of desired wavelengths while effectively reflecting unwanted wavelengths. High power versions of Laser Line Windows are also available for higher energy laser applications where higher damage thresholds are needed. Acrylic Laser Windows are ideal for laser applications that use Nd:YAG, CO2, KTP or Argon-Ion laser sources. 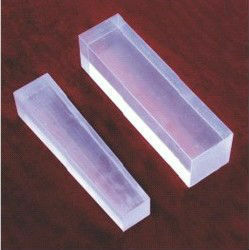 Acrylic Laser Windows may be easily cut to fit into any shape required. 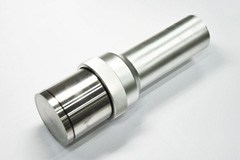 Laser Speckle Reducers are also available for reducing speckle noise in laser systems. Due to advances in material and manufacturing technologies, the vast majority of lenses used on long-wave infrared (LWIR) cameras are simple: One- or two- element designs with an emphasis on low-cost manufacturing. One effect of this is that most of these cameras are supplied without any means for the user to focus them. This means that the lens must stay in focus over a broad range of temperatures. Since the standard temperatures range for use outdoors is -40°C (really cold) to +85°C (much too hot! ), this can provide some interesting design challenges. Most materials have properties that change with temperature, and all the materials that can be used to make lens for the LWIR waveband have properties that change. For optical performance, there are two relevant properties to consider: the thermal expansion (α), and the way the refractive index changes with temperature (dn/dT). The refractive index (n) defines the optical power of a lens —he higher the index, the stronger the lens — and this changes with wavelength. Figure 1 shows how these combine to cause a change (Δs) in the distance from the lens to the focal plane. Scintillator CsI(Tl)’s maximum of the broad emission situated at 550nm which allows Si-photodiodes to be used to detect the emission. The use of a scintillator-photodiode pair makes it possible to diminish significantly the size of the detecting system (due to the use of photodiode instead of PMT), to do without high-voltage supply source, and to use detecting systems in magnetic fields. The high radiation resistance (up to 102 Gy) allows CsI(TI) to be used in nuclear, medium, radiation detection and high-energy physics etc. Special treatment ensures obtaining of CsI(TI) scintillators with a low afterglow (less than 0.1% after 5 ms) for the use in safety inspection and imaging.